In April, then-Gov. Jerry Brown granted Trump’s request to send 400 National Guard troops to the border. Brown said he agreed to the National Guard mission after persuading the federal government to pay for it and to keep the guard members under the direction of the state of California. Brown also ordered that the guard members not enforce immigration laws or participate in the building of a border barrier. But, Brown faced criticism from members of his party and immigrant rights groups who argued that providing support to the federal government could free up U.S. Customs and Border Patrol officers to increase detentions and deportations of immigrants. In recent months, at least five governors recalled troops or withheld resources for Trump’s immigration policies. The efforts to counter the Trump Administration’s immigration enforcement increased last summer after outcry over the separating of families at the border. Then in October, Trump deployed more than 5,200 active-duty military troops to the border as a migrant caravan from Honduras, Guatemala and El Salvador was arriving at the United States’ southern boundary. Last week, New Mexico Gov. Lujan Grisham countered by ordering the removal of most of the southwestern state’s troops shortly before Trump’s State of the Union address. Grisham said there is no overwhelming national security crisis at the border. Newsom is expected to make similar remarks in his first State of the State address on Tuesday. Excerpts of Newsom’s speech have already been released. 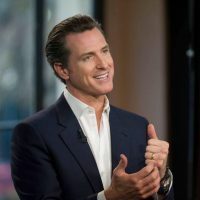 Newsom says he will sign an order to redeploy the troops to support wildfire prevention efforts and expand operations against drug cartels and drug trafficking across California. Under Newsom’s order, a small group of forces trained in spotting narcotics would be stationed at California’s international points of entry. At the federal level, the ongoing battle over funding for Trump’s proposed border wall could lead to another partial government shutdown. During his State of the Union address, Trump showed little willingness to compromise, doubling down on calls for a wall and saying illegal immigration is a source of crime and a costly burden on taxpayers. Newsom’s order calls for National Guard troops to be pulled back from the border no later than March 31.